Gone With The Wind (1939) is a film easily defined by statistics. It is oft-quoted that if box office receipts were adjusted to allow for inflation it would stand as the highest grossing film of all time. Whilst this short hand is all very well and a useful way to impart significance and stature, does the quality of a film become lost in such facts and figures? After all, strip away the paraphernalia and the important thing is, and always will be, the film itself. In the case of Gone With The Wind, there is a lot of film to consider. Clocking in at 233 minutes, it is certainly likely to pose an interesting curiosity for unacquainted modern audiences. 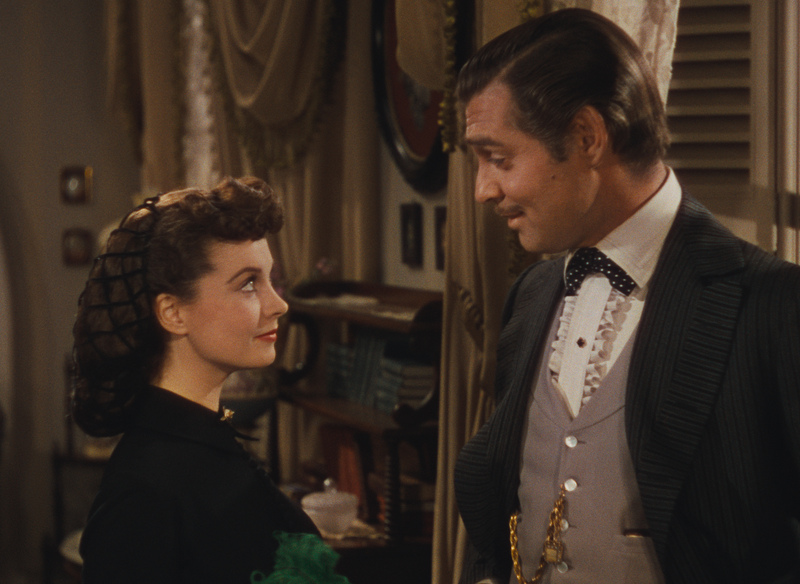 However, let such reservations be silent, for after a 25 year absence, Scarlett O’Hara and Rhett Butler are now ready to grace the big screen once more in a pin-sharp 4K restoration of the original print. First things first, how does the promise of a 4K restoration stand up? What does it mean? Well, the picture has a clarity that showcases the full embrace of the Technicolor potential. The potential for 1939, that is. Expectations need to be reasonable about what can be achieved. With that in mind, it is worth saying that the acutely defined images are beautifully rendered. At various points, this does step into being a crystal clear presentation. At others, truth be told, there is not that much of a notable difference. When it works well, the marriage of picture and content work in glorious harmony – blood red skies and pounding rain; the prophetic fallacies writ large. Lush strings hum and soar throughout just as they always did. Sometimes they remain overwhelming in their engulfment of the drama, acting like a cattle prod to inform feelings and reactions. There are certainly moments when the notch is cranked a little too close to eleven and through contemporary eyes a tempered measure may have been more effective. Well, subtlety was not a tool in David O Selznick’s Gone With The Wind toolbox, but such mannerisms should be forgivable as these were de rigueur for the period. However, casting aside the looking glass of the modern era (on material that is 74 years old), this is still a film that works exceptionally well on a number of levels. Surprisingly, for such a long feature there is propelling forward motion and, scene to scene, matters flit with a potent pace. The power conjured by the two luminous and sparkling leads continues to crackle with a kinetic and palpable chemistry. Their magnetic charge is undiminished by the passing of time. The key to its success over all though is the fact that it is equally comfortable focusing on shade as well as light. Margaret Mitchell’s Pulitzer Prize-winning novel was given justice. Scratch underneath the surface of the antiquated and outdated notions and the brittle hard hitting themes of love and war resonate in the same way as the topics tackled by, say, Tolstoy or Dostoevsky do. When will Hollywood realise that the most enduring and resonant works are those that embrace darkness and the absurdity of life in the face of death? Sadly, it is hard to think of Hollywood ever daring to draft such a broad and widescreen drama again. Certainly not one that relies so heavily on character and not so much on special effects. It would not attract funding. The likes of Gone With The Wind have, well, gone with the wind. When all is said and done, frankly, audiences are right to give a damn and the studios should too. They really don’t make them like this anymore. 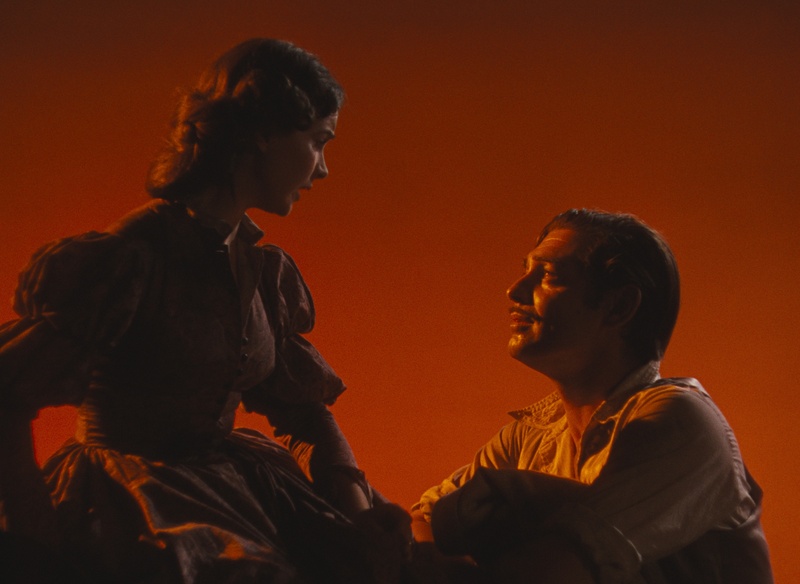 This entry was posted on 28/11/2013 by toomuchnoiseblog in Reviews and tagged bfi, Cinema, clark gable, david o'selznick, Film, Gone With The Wind, Greg Wetherall, movie, re-release, restoration, Review, vivien leigh.